Improve the look of your home with Argus Slat Fencing, a versatile product that will suit any home or decor. Not just limited to fencing, we can also measure, make and install slats as fence infills, gates, awnings, and screens. Aluminium slats are a modern and functional fence, ideal for the modern home. Customisable, the fencing slats are available in 38mm, 65mm & 100mm and can be powder coated in a wide range of colours including Knotwood, a timber look powder coat. You can further customise the look by specifying the orientation of the slats and the spacing in between. Useful as infills on brick or rendered garden walls, and can be made to measure. Aluminium slat fencing does not warp or splinter, and they dont rust either. They are a perfect fencing solution for years to come. Unlike wooden fence panels, you will never have to worry about oiling or painting an aluminium slat fence. Durable, aluminium fencing will not be a target for termites either. Let Argus help you choose an aluminium slat gate to match your slat fence. All made to measure and to match your modern home exterior. Combine with a digital lock form our range of security locks, for complete home or office security. 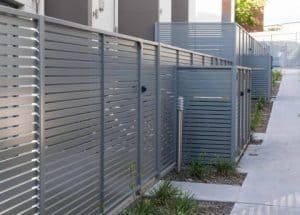 We also offer Colorbond fencing which is just as durable as aluminium slat fencing, but can compliment the exterior of your home where a colorbond roof or matched paint has been used on the guttering.